Greetings from the Association of African Universities (AAU) and the Association for the Development of Education in Africa's Working Group on Higher Education (ADEA-WGHE). Trust this mail finds you in good health. 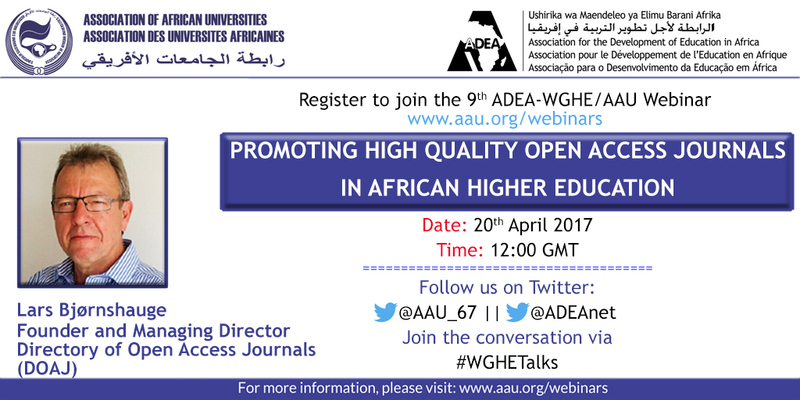 We have the pleasure to invite you to make time to participate in the 9th AAU/ADEA-WGHE Webinar. The 8th webinar will focus on the important topic "Promoting High Quality Open Access Journals in African Higher Education"
This webinar will be presented by Dr. Lars Bjørnshauge, Founder and Managing Director of DOAJ (Directory of Open Access Journals). Please find attached, the concept note and promotional flyer. Kindly extend this invitation to your colleagues.